So Are You Still Writing or What? In case you didn’t read the articles and statistics that lead up to the switch (according to my blog stats, few of you did), I realized that no one but other aspiring authors care about dialogue and how to write a convincing antagonist. So, I started writing blog posts about other things that interested me: food, home décor, TV, and whatever else I thought others might find informative. Turns out, you guys seem to find these topics more interesting as well. That doesn’t mean, however, that I’ve abandoned writing my trilogy. Around last July, I wrote about the book that ruined my life. It was one of many books on writing that I read last summer that made me realize that I needed to step up my game. I had written the first drafts of all three novels by that point and was feeling pretty good. It was an accomplishment, but I began to realize that the amount of work required to write a really good book instead of a decent book was vastly different. If I wanted to write novels I was proud of, then I needed to almost start from scratch. That’s a hard decision to make when you’ve already spent a year writing 300,000 words. Still, after a short pity party I got about the business of writing a better book. Surprisingly, I have found I really enjoy even the nitty gritty background work of research, outlining, and character development. So, here’s a peek into what I’ve been doing. I set up an office upstairs with a door and everything so I can work without letting myself get distracted. I’ve got a desk for editing, but I do my writing in that recliner with my laptop. I’ve found it’s a lot harder to get back and shoulder pain in a recliner. Stooping over a desk is for the birds. 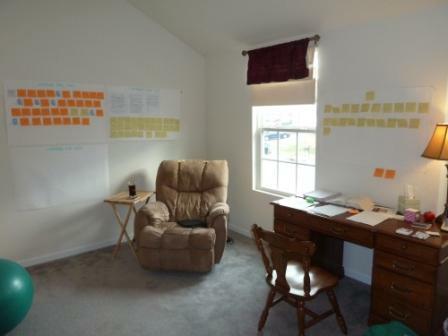 The art on the walls is large pieces of paper and post-its I’m using to plot out various events and character arcs. I also use them as brainstorming boards. No use straining your eyes for spoilers. I purposely took the pictures far away and then compressed them. This one is the board right over my desk, so functions as the brainstorming board for whatever current story problem I’m chewing on. Right now, that’s making my villain a lot more robust. I took this picture a couple weeks ago, so my board’s so full now I might have to spill out onto the adjoining wall. 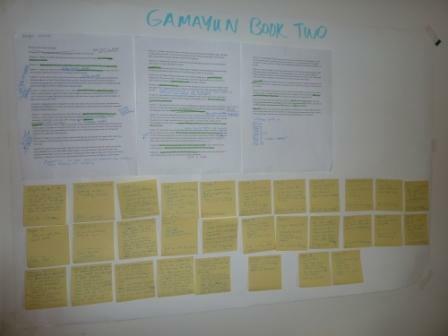 Here’s a chapter-by-chapter layout for the first book, where the different colored post-its represent different character’s points of view. Extra points for the nerds that noticed the Napoleon Dynamite Liger notes and the Doctor Who TARDIS notes. 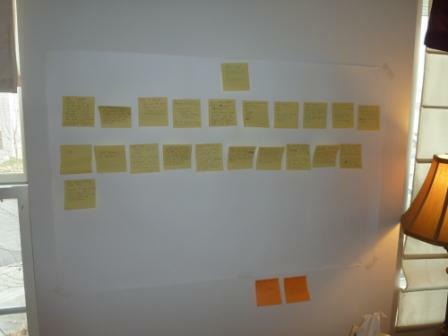 Another board for book two, where I was trying to decide what events to keep from an outline of the first draft I wrote. 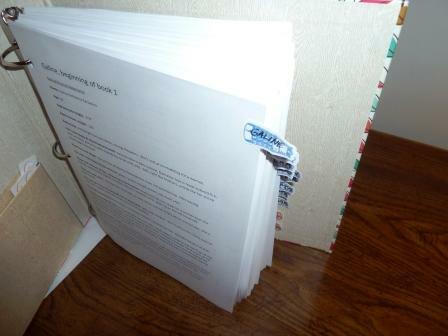 The outline is the typewritten pages at the top, and the post-its at the bottom are what I eventually decided to use. To help you get a perspective of how much I’m changing, the occasional green highlights you see in the outline were the only “must keep” events I had. Character profiles were another project that kept me busy for a few months. That binder is as thick as printouts of my novel manuscripts. Every character in my trilogy got a full work up. I can tell you everything from what they smell like to the layout of their apartment. Yes, those are Dalek flag markers. What can I say? 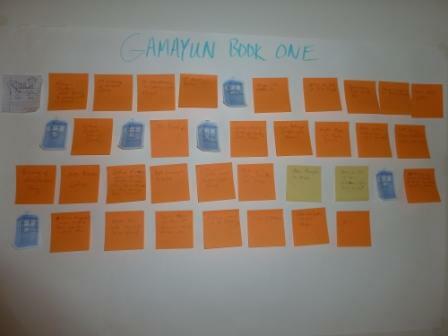 My sister bought me a set of Doctor Who post-its and I use them liberally. Anyway, I thought I’d give all of you a peek into what I’ve been up to. The writing is still happening and going well. It’s just happening a bit slower than the breakneck speed it was at before.